Brandi’s beautiful pup Bailey decided that she would redecorate to help her mom sell their house. The house was shown three times with the big ol’ hole!! We posted this picture back in January, but sadly, Bailey passed away recently, so let’s send big warm hugs so the Schile family today. Talk about leaving a huge hole… I am so sorry for the loss of your precious Bailey. May you hold your wonderful memories close to your heart during this difficult time in your lives. I’m so sorry you lost your beautiful dog. Sending you warm thoughts. So sorry for your loss. 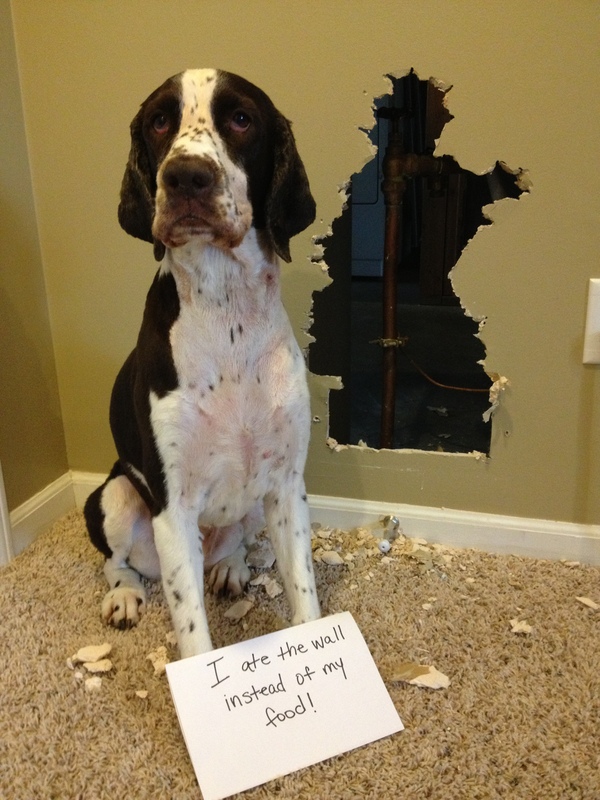 This posting made me laugh so much and remember my dog, Skip, who did the same thing to my back door many years ago. So, so sorry for your loss. Losing a fur baby is not easy, but the memories they give us will last forever. It’s never easy losing a four-legged family member. Glad you have some funny memories of Bailey…beautiful dog. My girl <3 Thanks so much for re-posting, this has made my heart so happy today! I’m so sorry for your loss Brandi! 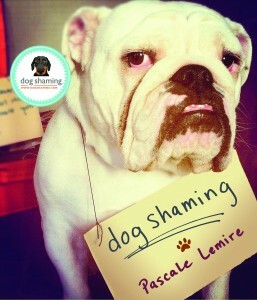 This “shaming” was one of my favorites! So sorry for your loss. Springers have a way of leaving special marks on our lives. Bailey was a beautiful pup, and I’m sure you two had a great life together. I’m so sorry for your loss. Bailey was a beautiful dog who could really do a number on a wall! Happy memories! You were both very lucky to have had each other and I’m sure you will have each other again, it wouldn’t be heaven without our beloved pets. The loss part is so hard to take but it’s worth it just have our lives blessed with their presence. lol I’m not very religious but the thought of seeing my angel pets makes me believe just a little more. I am sorry for your loss. But I am sure every time you see this you will smile and shake your head…..you must have been a good parent because she sat there so pretty and patient for this picture. Oh, Bailey! You sweet, beautiful mess, R.I.P. at the Rainbow Bridge for your loving mom Brandi. I wish you peace and comfort to heal your broken heart. So sorry for your loss, Brandi. This was one of my favorites. RIP in doggie heaven, Bailey! So sorry for the loss of your beautiful pup. His intentions were anything but legal on that job…..scrap copper buys a lot of toys. So sorry for you and your family. Only we who have loved them so and had to let them go know how hard it is to say “wait for me on the other side of the bridge, I’ll be there and we will be together again”. (Hugs) Praying for you on the loss of your four-legged child. I’m sure the memories of Brandi’s antics will bring smiles, sweet dreams Brandi. So sorry t hear about the loss of your dog. I had a Springer when I was growing up. They are such wonderful dogs. I hope the passage of time will help ease your loss. I love you Bailey! I pray you have found all our beautiful fur babies in heaven to play with. I know you’re having a blast. We miss you down here though. Kisses! We lost our Bailey last year. Sending you hugs. Rest In Peace Brandi! Sorry for your loss. Sending love and compassion to the family! So sorry for your loss. A beautiful girl. In tears for you over the loss of beautiful Bailey. Please accept my most heartfelt condolences. So sorry for your loss. What a beautiful girl she was and obviously she was quite a character looking at her decorating skills!